Synthetic peptide conjugated to KLH derived from within residues 100 - 200 of Human UCP1. WB: Mouse and rat brown adipose tissue lysates. Our Abpromise guarantee covers the use of ab23841 in the following tested applications. WB Use a concentration of 1 µg/ml. Detects a band of approximately 33 kDa (predicted molecular weight: 33 kDa). UCP are mitochondrial transporter proteins that create proton leaks across the inner mitochondrial membrane, thus uncoupling oxidative phosphorylation from ATP synthesis. As a result, energy is dissipated in the form of heat. Additional bands at: 100 kDa, 50 kDa. We are unsure as to the identity of these extra bands. ab23841 staining UCP1 in serial sections of white fat from mice by immunohistochemistry. Serial sections were de-paraffinized, rehydrated through xylene, ethanol and water; antigen retrieval was by heat mediation in a citrate buffer. Samples were incubated with primary antibody (1/200 in blocking buffer) for 60 minutes. 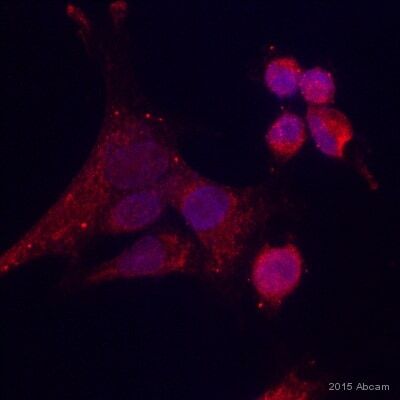 A HRP-conjugated anti-rabbit IgG was used as the secondary antibody. Publishing research using ab23841? Please let us know so that we can cite the reference in this datasheet. 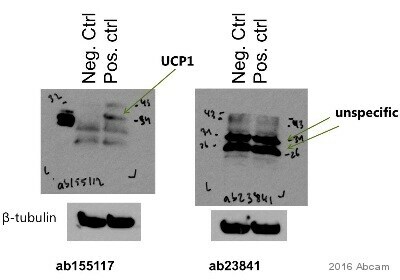 I’m very interested in purchasing anti-UCP1 antibody (ab23841) with custom fluorescence conjugate like Alexa Fluor 647. I want to know how long it will take to get fluorescence-conjugated anti-UCP1 antibody. I also want to know how to place the order like this and how much it will cost. We do not currently offer this antibody directly conjugated to a fluorophore.I could see if the lab would be able to generate this for you, but we do not carry Alexa Fluors. We may be able to provide this service if you order in bulk (>10 units) with a Cy5 conjugation. If you would be interested in this, please email my colleage Andrea who handles bulk requests at mailto:us.sales@abcam.com. Alternatively, you could do the labeling yourself using one of our 3-step EasyLink conjugation kits. Again, we don't carry Alexa Fluors, but you would be able to label Cy5. You can remove the BSA using a purification kit like ab102783 (1 purification, $221.00) or ab102784 (3 purifications, $438.00). Have you done a blocking experiment with the antibody and peptide? Do you have an image? I've attached one of our blocking experiments with the antibody and peptide combination. Ab47431 gave a band around 50 kDa instead of 150 kDa, and ab23841 did not show any bands. Thank you very much for your call today and for letting us know about the trouble with these antibodies. I'm sending a free of charge vial of ab14571 on the order *** which should arrive on Tuesday, to replace the vial of ab47431. Please keep me updated about the results with ab23841 after trying the alterations we discussed. I look forward to hearing from you. If there is anything else that we can do for you, please let me know and I'll be happy to help. 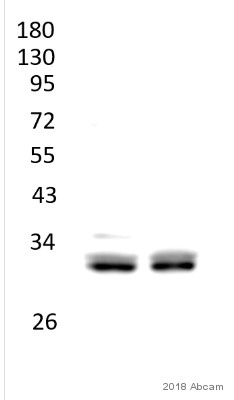 The most recent vial failed in western blotting at 1/1000 (no signal) compared to an earlier lot that worked well at 1/10,000.